In the early 1990s the California artist Daniel McCormick began to go beyond witnessing and documenting environmental damage in photographs to create artworks as ecological interventions, adding aesthetics to ecological restoration. Joined by artist Mary O’Brien, they founded Watershed Sculpture as a studio to address sites in need of environmental remediation. Their sculptures, most of which are located on public lands and in open spaces, work to restore the equilibrium of watersheds and other ecosystems adversely impacted by rural and urban communities. Using elements from the places where they work, such as cuttings from willows and other flora, McCormick and O’Brien weave natural materials into large basket forms that they then live stake onto the site. The sculptures, as they grow into silt traps, erosion control implements, fish habitat, and other ecological enhancements, eventually disappear, becoming part of the land and waters they serve to improve. McCormick and O’Brien have been commissioned to create watershed sculptures as close as eastern Marin County, where they live, to as far away as the Louisiana coastline, where they worked to restore damage to natural storm surge barriers caused by hurricanes. Their works often become community projects involving land managers, water quality agencies, schools, and local nonprofits. In addition to creating sculptures, they are often engaged as consultants in community master planning. In 2013, McCormick and O’Brien began working with The Nature Conservancy to create works along both the Carson and Truckee rivers. 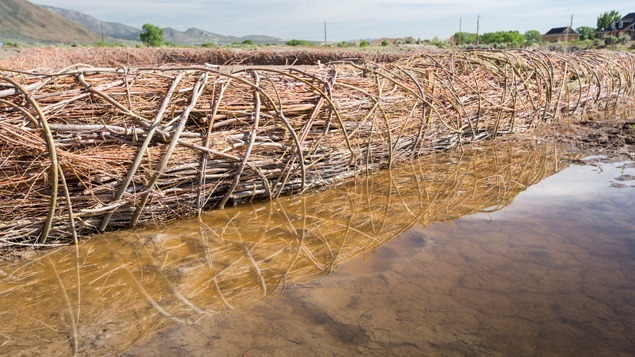 Part erosion control, part habitat development, the 360-foot-long woven structure built in spring 2014 at the River Fork Ranch Preserve in the Carson Valley is their longest structure to-date. Beginning in summer 2014 the pair drew up sketches for the work to be implemented along the Truckee River at the McCarran Ranch Site just east of Reno. This exhibition draws upon archives donated by the artists from their previous works, as well as these two local projects. Daniel McCormick is an interdisciplinary artist with integrated skills in sculptural installation, environmental design and ecological restoration. He earned a degree in environmental design from UC Berkeley, and has studied with James Turrell. He is the recipient of numerous awards and his work has been featured in exhibitions at the Oakland Museum of California, Sonoma Valley Museum of Art, Bolinas Art Museum, Headlands Center for the Arts, Armory Center for the Arts in Pasadena, CA and the McColl Center for Visual Art. Mary O’Brien is an award winning sculptor and creative director who works in film, video and sculpture. She received a BA in Political Science from Marquette University, studied environmental communications at the University of Minnesota, and earned a Post-Baccalaureate Certificate in Studio Arts from UC Berkeley. Learn more about The Nature Conservancy artist collaboration here: nature.org/nevadaart.